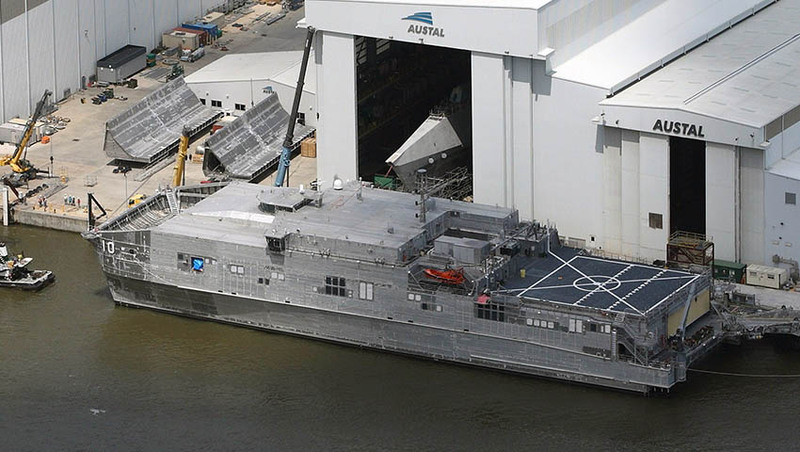 Austal has announced that its American subsidiary, Austal USA, has delivered the Expeditionary Fast Transport ship USNS Burlington (EPF 10) to the US Navy. It is the 10th ship delivered by Austal as part of a US$1.9 billion contract for 12 vessels, and the fourth delivered to the US Navy this year. "Austal takes great pride in sending another EPF to join the Military Sealift Command (MSC) fleet. The success of this milestone achievement is a result of the dedication and hard work of the Austal team,” Austal chief executive David Singleton said. The USNS Burlington is a 103-metre aluminium catamaran that has the capability to transport 600 tons, 1,200 nautical miles at an average speed of 35 knots, and is designed to operate in areas too shallow or narrow for larger ships in the US Navy fleet. The vessel's flight deck can also support flight operations for a wide variety of manned and unmanned aircraft. Construction for the Spearhead Class vessel began just over a year ago, and was officially launched in March 2018. Upon delivery of the USNS Burlington, two additional Spearhead Class EPFs are being constructed at Austal's Mobile, Alabama shipyard. The Puerto Rico (EPF 11) has recently been launched and is being prepared for sea trials, while Newport (EPF 12) is being erected in final assembly. Austal also recently received instruction from the Navy to order long lead-time materials for EPF 13, and are also contracted to build the Independence-variant Littoral Combat Ships (LCS) for the US Navy. Nine LCS have been delivered while six are in various stages of construction. Austal is an Australian shipbuilder and global defence prime contractor that designs, constructs and sustains some of the world's most advanced commercial and defence vessels. 2018 signalled 30 years of business for the company, which is Australia's largest defence exporter. Austal is the only ASX-listed shipbuilder and has shipyards in Australia, the US and the Philippines.